Home > Real Estate - Investment > How Real Estate Investment Differs From Speculation..? How Real Estate Investment Differs From Speculation..? In financial circles, the terms real estate investors & real estate speculators are used to refer to people who are buying property to make a profit, rather than for personal use. Though the two terms are often used interchangeably, they are not exactly the same. Nevertheless, even veteran financial specialists tend to get mixed up between the two. In order to understand the difference between the real estate investor & the speculator, it is necessary to have a look at their methods of operation. A speculator predicts (or attempts to predict) the future return on any investment, and tends to be focused on short-term profits. He/she is often not very well informed on how the asset class of real estate works in a particular locality. 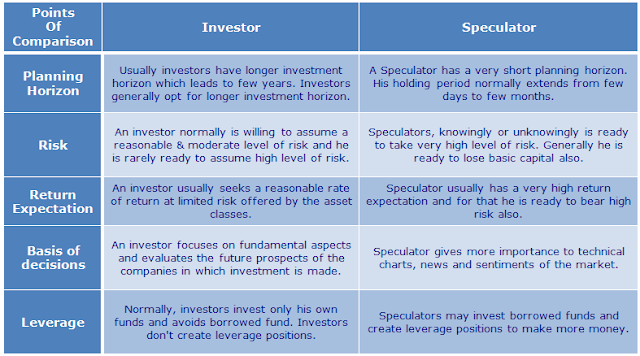 Since speculators are usually also active in other investment segments like stocks, bonds and bullion, they tend to use the same approach for all asset classes. The general approach is to buy low and sell high in a very short period of time. A real estate investor, on the other hand, makes a careful analysis of the current market position, market trends and related affecting factors so as to make an informed and forward-looking investment decision. Investors are not looking at short-term profitability, which is in any case not a viable objective to operate from in Indian real estate. While investors also tend to invest into other asset classes, they do not do so without fully understanding them. 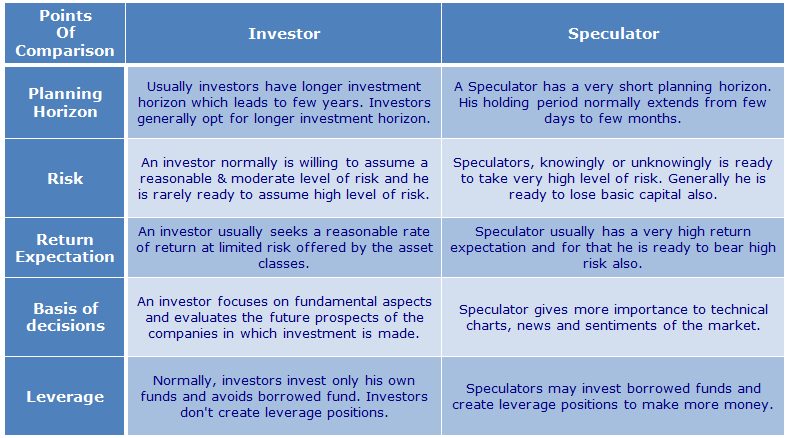 The next question about the difference between speculators and investors would pertain to the returns they get. 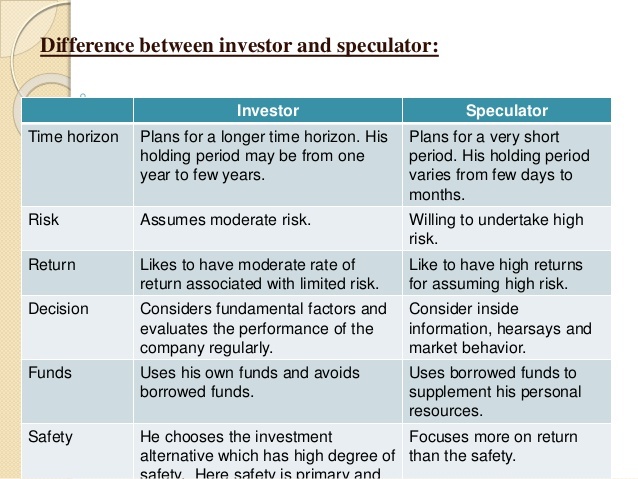 While a speculator may make a lot of money if he makes an accurate guess, all such returns are short lived. If the real estate market is facing a short-term decline, the speculator stands to lose all his money because he is also investing only for the short term. A related facet of real estate speculation is that it is, for the above reasons, not suitable for rental income generation. An investors, however, is looking at healthy, steady returns on capital appreciation and rental income. For this reason, he maintains a reasonable investment horizon which is tailored to the market dynamics of this particular asset class. This is important because Indian real estate is subject to cyclical ups & downs. A property cycle is dictated by various factors related to population growth, GDP, policy framework and sentiment, and boom & slump periods are more or less a given. Indian property investors aim to ride through the predictable ups and downs of this cycle. To do so they must remain invested for a period of at least 5 to 7 years. Another reason why a longer investment horizon is important is that most investors look at buying properties at a lower rate at new locations in anticipation of the demand to come. For this to bear fruit, they must give these locations sufficient time to receive basic infrastructure and spillover demand from adjoining areas. Long-term investments made by property investors provide stable and reliable returns. Investors are not prone to losing their money due to a receding market, because they have made a more careful analysis of the market condition and are willing to wait till their expected results are delivered as per the market data before they make their move. Also, real estate is by far the ultimate asset since it not only grows in value but also performs as a rental income generator. But it must always be approached from an investor’s perspective rather than from speculative objectives.